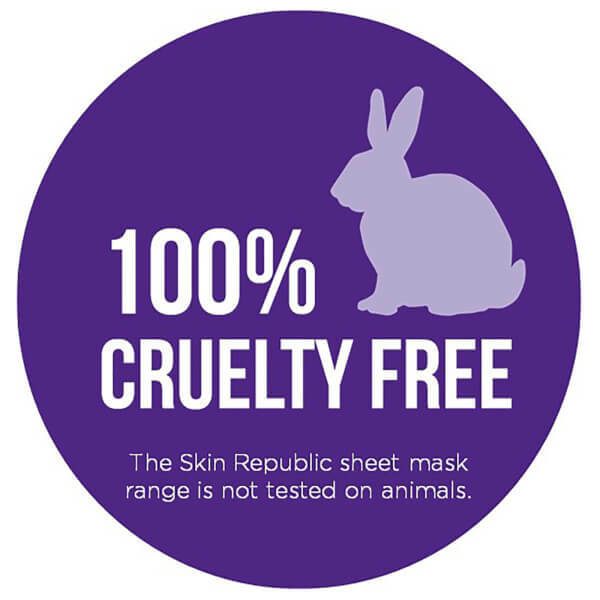 Treat hardworking hands to the Skin Republic Hand Repair, a serum-infused, anti-ageing hand mask that performs deep level action to help soften, moisturise and repair dry, rough hands. 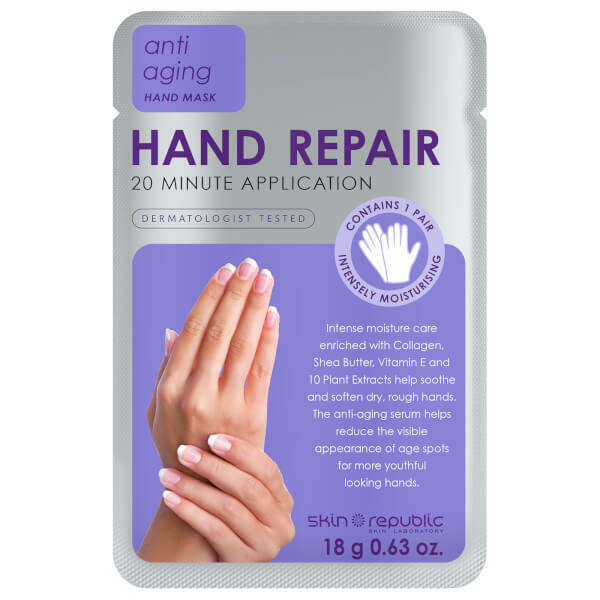 Delivering nutrients and intense moisture with close and continuous contact, the 20 minute treatment works to expertly hydrate and nourish dry hands and rough skin. 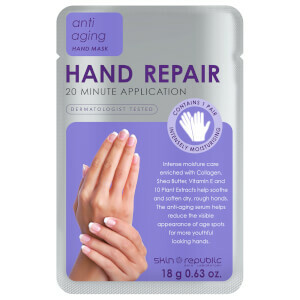 Helping to soothe and maintain healthy skin, its combination of 10 antioxidant and vitamin-rich plant extracts work in synergy to infuse hands with natural goodness. Collagen and Shea Butter boost elasticity and moisture, whilst a host of Fruit extracts and Vitamin E repair, help slow down the ageing process and decrease the appearance of wrinkles and age spots. Intensely moisturising, the treatment will leave hands feeling supple, hydrated and youthful. Shea Butter - deeply moisturising, it heals chapped, dry skin and has anti-inflammatory properties. Grape Fruit Extract - contains a powerful antioxidant. Helps repair and maintain healthy skin. Orange Fruit Extract - exfoliates and moisturises with Alpha Hydroxy Acids. Apple Fruit Extract - refines and protects skin. Helps lighten age spots and promote cell generation. Lemon and Lime Fruit Extracts - source of Vitamin C known to stimulate collagen and decrease wrinkles. Rosa Centifolia - a therapeutic astringent to tighten pores and remove excess oil without drying.